Foam cell associated with which among the following? 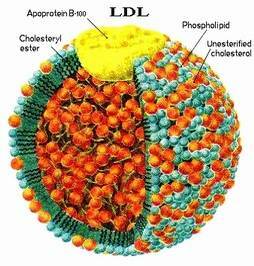 Low density lipoproteins (LDL) are deposited under the endothelial cells, which undergo oxidation by free radicals. This attracts macrophages. Macrophages are then converted into foam cells initiating atherosclerotic plaque formation. Increased levels of cholesterol for prolonged periods will favour deposits in the subintimal region of arteries. Aorta, coronary arteries and cerebral vessels are predominantly affected by the atherosclerotic process. The LDL cholesterol, especially oxidized LDL particles are deposited in the walls of arteries. Plasma LDL is mainly catabolized via apo-B LDL receptor pathway. But a small part of LDL particles are degraded by nonspecific uptake of macrophages. Free radical induced oxidative damage of LDL will accelerate this process. Later, the macrophages become overloaded with cholesterol, and these are then called “foam cells”. Page No:335,436, Chapter:Hyperlipidemias and Cardiovascular Diseases; Free Radicals and Antioxidants; Textbook of Biochemistry for Medical Students by DM Vasudevan/ 7e.